When Michael W. Kearney learned in October that he will be this year's Rex, king of Carnival, he was sopping wet - he had just come in from a downpour - and deeply doubtful that this accolade was really being conferred upon him. After all, Kearney had been one of a small group that Rex spokesman King Logan described as "default Rexes," the men whose civic resumes and devotion to the krewe lead Carnival insiders to believe fervently, year after year, that one member of this group will be picked to wear Rex's crown on Mardi Gras and wield his scepter. This year, it's Kearney's turn to mount the king's float on Tuesday (Feb. 9). Really. But he's still just a little bit skeptical. "I'm still pinching myself to make sure that they're not pulling my chain," he said, chuckling. But because Kearney, 75, was speaking less than a week before his 24-hour reign, he quickly added, "I think it's getting too close for me to be a decoy." Becoming king of Carnival "crossed my mind" from time to time during his long history with the Rex organization, Kearney said, "but I never really thought that it would be possible." This attitude is no act, said his nephew Bill Kearney IV. "There's never an expectation that anything is coming this way." Now that Michael Kearney is convinced that he will, indeed, reign, he seems a perfect fit for the role because this man is nuts about Mardi Gras and Rex's role in it. In fact, it would be hard to find anyone who is as enthusiastic about the city's signature event as Kearney, a lifelong New Orleanian who went to parades as a child and has been riding in Rex's procession - first on a float, then on horseback as a lieutenant - for nearly a half-century. "Mardi Gras is all part of me," he said. "I just love this city, and I love the Mardi Gras. I just think it shows the distinctiveness of the character of the city. I've been to other places that try to have a Mardi Gras, ... but nothing comes close to this. "It's just in the psyche of the citizens. There are not too many places where people will trample over one another to get a pair of beads or a worthless doubloon." Kearney has definite ideas about Rex, whose lavish parade - this year's theme is "Royal Gardens - Horti Regis" - represents the climax of the annual celebration. Although tradition says Rex can't toss trinkets to his subjects, "I'm going to smile from ear to ear - that's the best tonic I can think of - and be as happy as I can be," Kearney said, speaking in what his friend Lynes "Poco" Sloss described as "a sonorous baritone." Rex 2016 king Michael Kearney. In preparing for his royal role, "I think about the enormity of having this honor," Kearney said, "and I hope that I can be worthy of it and pull it off the way it needs to be pulled off." Kearney was sitting in the ocher-walled living room of his house, which has a commanding view of Audubon Park. As he spoke, his white Lab, Captain, lay at his feet, happily gnawing on a marrow bone. For all Kearney's initial skepticism about becoming this year's Rex, he is no stranger to the inner workings of Carnival. His daughter, Niquette, was Rex's consort in 2001; her reign is commemorated with a fanciful George Schmidt painting of that year's Rex ball that hangs on a nearby wall. And Kearney's wife, Suzanne, who is known to all as Susu, designs the costumes each year for the 455 men who ride Rex's floats. Her purview, however, does not include Rex's regal outfit, which does not change from year to year. Even though Susu Kearney regularly deals with leaders of the Rex organization as she comes up with ideas for vivid togs - she has been at it for 42 years - she said she never heard a whisper of gossip that her husband might be Rex. "This has been a revelation to me," she said. "As long as I've been around, you'd think I would have figured it out. It's incredible, the links they go to to keep this secret. Very few people are brought into the loop." This year's Rex is chairman and CEO of The Kearney Companies Inc., a New Orleans-based enterprise that, he said, "is in the business of helping the client get a product from Point A to Point B." This involves such duties as trucking and transferring products such as metals, paper and cotton from a train to a container and vice versa. This line of business has been a family affair. His grandfather William J. Kearney founded the New Orleans Stevedoring Co. in the 1890s. Before establishing The Kearney Companies in 1996, Michael Kearney was president of Neeb-Kearney & Co. and The Jackson-Kearney Group. In 1997 he became president of Transocean Terminal Operators, a stevedoring company. "His work (in port-related activities) would have put him in the position of being king of Carnival a century ago," said Dr. Stephen Hales, the Rex organization's historian. "Mike's work in that area is the substance of New Orleans commerce, and he does it at all levels." 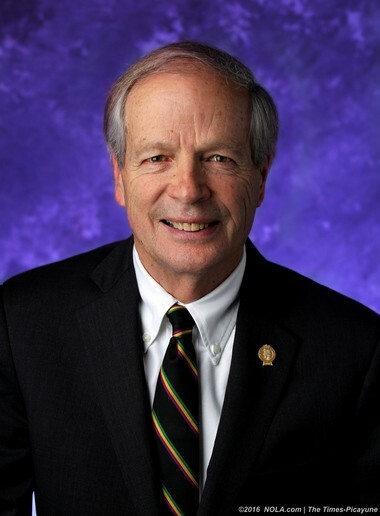 Kearney, a graduate of De La Salle High School and Tulane University, sits on the World Trade Center's Advisory Board and is a former president of the New Orleans Board of Trade and a former member of the Louisiana Maritime Commission. He also is vice chairman of the Dock Board's Board of Governors. Last year, his work in the maritime community earned him the C. Alvin Bertel Award from the World Trade Center. In civic work, Kearney was a member of the commission that brought New Orleans its first Super Bowl, in 1970. He was chairman of the Mayor's Sports Advisory Committee and a director of the New Orleans YMCA. Before Hurricane Katrina and the subsequent flooding ravaged the New Orleans area, Kearney said he had put his public-service activities on hold to concentrate on business. "Katrina changed it for all of us," he said. "We realized that if we didn't get involved, there wasn't going to be a city of New Orleans." Kearney focused on economic development to help revitalize the city. He was in a group that formed what has become known as the New Orleans Louisiana Business Alliance, which was active in such projects as landing a Costco store and a Wal-Mart in Gentilly, and redeveloping the Riverwalk. The alliance's latest focus, he said, is to develop the economic potential of the area surrounding Tulane's and LSU's medical centers and the new University Medical Center. Kearney also is on the board of Ochsner Baptist Medical Center. Within the Rex organization, his activities have included organizing the annual luncheon at Arnaud's Restaurant that the krewe holds for members of the police and fire departments and other first responders. Kearney's record has prompted friends to wax enthusiastic about his selection as Rex as word seeped out. "He cares a hell of a lot about what would be good for New Orleans," Sloss said, "and he works like hell to get there." Kearney, who has four children and three grandchildren, plays tennis as often as six mornings a week. Hales, who often plays against him, described him as fiercely competitive. She will reign with Rex, king of Carnival, on Mardi Gras.